In 1941, Disney wasn’t doing too well financially. It was the success of a short 64 minute animated movie about an elephant who could fly that would launch Disney back into the successful realm of cinema. Since then, this film called ‘Dumbo‘ has brightened our days throughout the years, made us sing along to its original and amazing songs, and fall in love over and over with each viewing with the titular character ‘Dumbo‘. It was a simple story about a newborn elephant with large ears. All of the other animals and humans at the circus made fun of Dumbo, which caused his mother to protect him, thus forcing her to leave Dumbo and be locked up because she became “dangerous”. Turns out, Dumbo could fly with the help of his mouse friend and became the star of the circus, eventually living a life of luxury and reuniting with his mother. It’s a beautiful story for sure with a couple of thought-out, well designed characters. 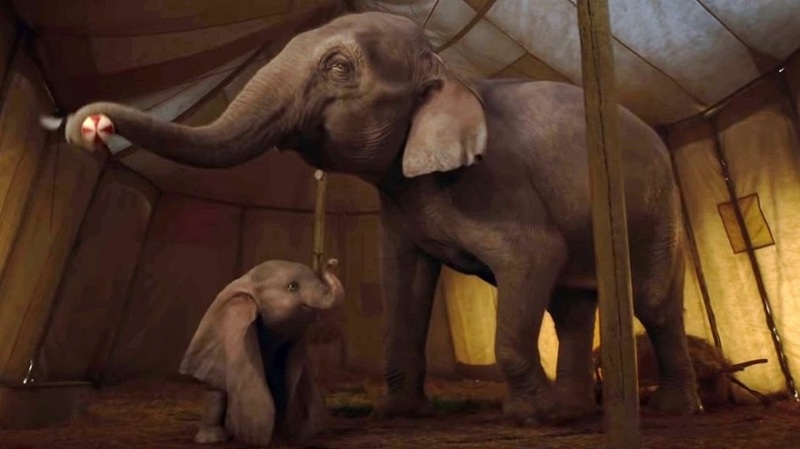 All of the magic that is Dumbo, the richness, story, and heart is completely lost on Tim Burton’s live-action animated remake ‘Dumbo‘. I feel this way about each and every single Disney live-action animated film recently too. 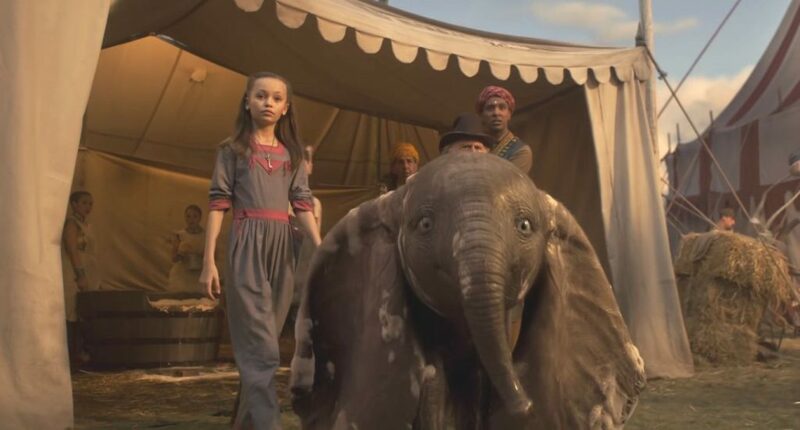 ‘Dumbo‘ takes it a step further though and adds a ton of unnecessary characters and story plots that are so obnoxious that I couldn’t wait for this movie to end. It truly as an awful movie through and through, and I hate to say that, because I love the character ‘Dumbo‘ so much and quite enjoy Danny DeVito, Michael Keaton, Colin Farrell, and Eva Green in everything they do. Just not here, which is unfortunate. On the subject of Tim Burton, you can’t help buy bask in his unique, dark style for filmmaking. If you watch a Tim Burton movie, you know immediately that it is a Tim Burton movie by the way he lights his backgrounds, his camera angles, and his gothic-like props and Danny Elfman score that is a mix between a sweet candy and haunted house for the most part. ‘Dumbo‘ is no different from his previous style, where most of the film is in fact animated in the background (green screen style), but with human actors. Burton has done some wonderful films for sure since his debut with ‘Pee-Wee’s Big Adventure‘, but a lot of his remakes of classic Disney tales or novels have been for the lack of a better word – awful. And that’s what this remake of ‘Dumbo‘ is – awful. In fact, there is a character in the film played by Alan Arkin who basically looks at the camera and says, “This is a complete disaster.” It was as if he was in on the joke and was telling me what I already knew in the first 10 minutes of the film. It was the only time I felt an emotion during the entire movie, which was a disappointed laughter. Burton also took quite a few liberties with the story as well, and I give kudos to him for being original and not making a straight shot-for-shot remake of the animated film, but I have to take those kudos right back for failing miserably at every turn here, leaving a sour taste in my mouth for a character that I have loved since the early 1980s. 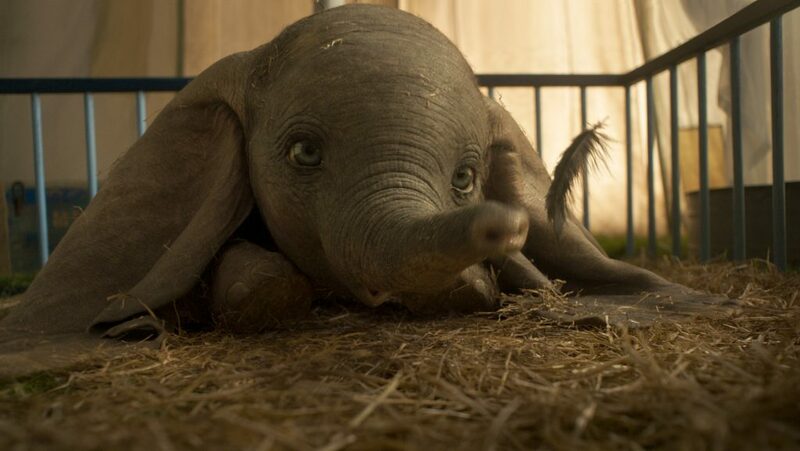 In the 1941 version, the movie is through the eyes of the lovable ‘Dumbo‘. 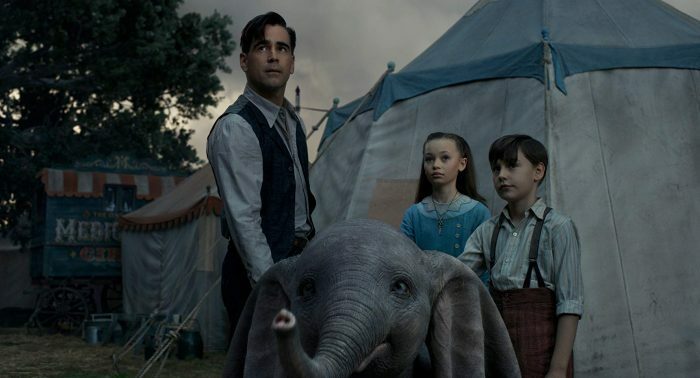 In Tim Burton’s remake, it’s told through the many eyes of new human characters, including the widowed and one-armed army vet, but now circus performer (Colin Farrell) and his two young kids (Millie and Joe), who take a liking to ‘Dumbo‘. The boss of the circus is Max (Danny DeVito), who runs his rough around the edges circus with his band of misfits who all take on multiple roles in his show. Meanwhile, a rich tycoon named Vandevere (Michael Keaton) and his high flying trapeze artist wife (Eva Green), hear about the flying elephant and decide to buy Max’s circus and bring them to his “Disneyland” type theme park as the main attraction. Little does anyone know that Vandevere has other sinister plans for the elephant. Where the first movie ended in 1941, where Dumbo flew at the circus, is about the 25 minute point in this bloated 2 hour affair and it feels like 4 hours getting through it all. Dumbo now can put out fires, save humans and even have people ride him like a horse in the air. Not only that, Dumbo is a side note to his own story, where the less than thrilling and at times over-the-top characters are the sole focus. This would be okay if any of the characters were liable, but none of them really are. DeVito is holding back here, although it’s always great to see him on screen. Keaton is so over-the-top and one note that you forget his character is a real person. Colin Farrell having a southern accent and not having any emotion through the entirety of the movie made me laugh and feel bad for him. Nobody is gonna believe Farrell is from the South. Then there are the two kids who are the prime focus in the film. Nico Parker who plays the young girl Millie is so bland and wooden through her role, that I thought she was just reading lines in a monotone voice instead of actually acting. The same goes for her brother in the film, but he was even more forgettable. As for the animation of Dumbo. It’s okay enough, but again, Dumbo shows almost no emotion with the exception of his eyes getting bigger in certain moments. There was more emotion in that 1941 animated film of Dumbo, than there is here, which causes you to care less for this once amazing character. It was a true let-down. Danny Elfman’s score pays tribute to some of the original songs, sans the most important one, which was unbelievable to miss out on a big opportunity like that, which is “When I See an Elephant Fly“. It’s not in there at all. I mean, that’s the point of the movie, right? Then there was the iconic “Pink Elephants on Parade” sequence from the original, but in this remake is basically a slap in the face to anyone who made the original and to its audience. Again, what ever magic, mystique, or fun the original 1941 film had going for it is completely lost in this remake. I’m willing to bet this is the worst film of the year or at least most disappointing. Instead of paying money to see this movie, just watch the original instead. You’ll be much happier. This entry was posted on Tuesday, March 26th, 2019 at 1:25 pm	and is filed under Film, News. You can follow any responses to this entry through the RSS 2.0 feed. You can skip to the end and leave a response. Pinging is currently not allowed. « ‘Relaxer’ – Film Review!